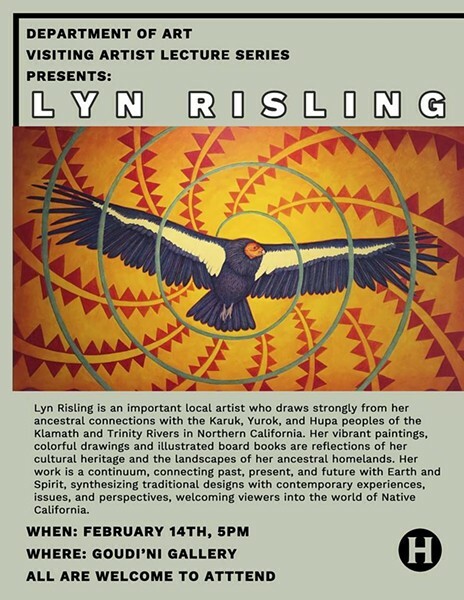 This exhibition celebrates the work of Lyn Risling, an important local artist who draws strongly from her ancestral connections with the Karuk, Yurok, and Hupa peoples of the Klamath and Trinity Rivers in Northern California. Her vibrant paintings, colorful drawings and illustrated board books are reflections of her cultural heritage and the landscapes of her ancestral homelands. Her work is a continuum, connecting past, present, and future with Earth and Spirit, synthesizing traditional designs with contemporary experiences, issues, and perspectives, welcoming viewers into the world of Native California.